The MI approach is a complex skill-set that doesn’t lend itself to a one-and-done training. After initial training, ongoing skill-building activities are needed. Using the MI approach can feel counter-intuitive to clinicians who have been trained to use an information-driven and directive patient education method. Building proficiency in MI demands practice and concrete feedback on a consistent basis, similar to learning to play a musical instrument or a difficult sport like golf. Unless an organization is recording patient sessions with clinicians that are assessed for fidelity to MI using a validated assessment tool, there is no way to determine if staff are proficient or even using MI. Onsite MI introductory and advanced workshops. Online interactive eLearning for MI. 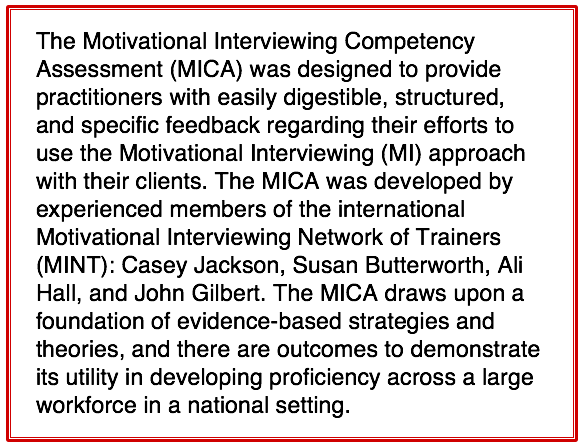 Feedback reports based on the Motivational Interviewing Competency Assessment (MICA) system. Telephonic one-on-one skill-building sessions for staff based on real patient sessions. MI Case Review: a dynamic new service that has received rave reviews from our clients. This online cost-effective program allows your staff to collaborate on MI case studies in a flexible and engaging way. For organizations, we can tailor the cases for your population and setting. For individuals, we welcome you to our community MI case review.